The 3.0m long Pipe Tube to fit on to all Rhino Products racks and all other manufacturer systems. Designed to safely transport copper, pipe and conduit. Manufactured from aluminium, the Pipe Tube’s nose cone combines a steel bulkhead for strength with a plastic nose cone to improve aerodynamics. 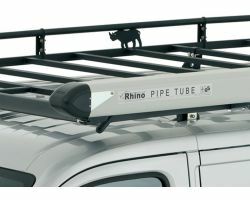 Does the Rhino universal 3m pipe tube carrier RP12 include brackets for connecting it to a roof rack? Hi Jonathan, yes the Rhino Pipe tube RP12 includes brackets for mounting on top of a rack. Kind regards.